Everyone’s talking about Mars, but what about poor Mercury? Mars has been hogging all the space news lately, what with the Curiosity roaming around on its surface and making discoveries that will change history itself. But there are a few other planets in the solar system that need some love as well. One of those is Mercury and scientists have found something that seems unlikely on this seriously hot celestial body - ice. 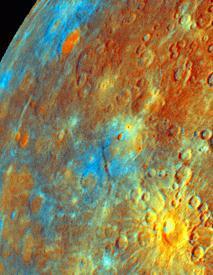 Though most of the planet’s surface is hot enough to melt lead, the poles of Mercury are a bit different. Almost no sun reaches the poles and there are several craters where the temperature is much colder. It’s estimated to get as low as -100 Fahrenheit, as a matter of fact. Scientists already theorized that there might be ice down in those craters and by using some technology they confirmed it. The NASA spacecraft Mercury Laser Altimeter has been hanging out in Mercury’s orbit for almost two years now, studying the planet. When it shined some light into the craters there was a reflection, thus confirming the presence of ice. The big mystery was not whether it was there or not, but more where that water may have come from. So far, the best explanation involves the crashing of comets into the planet, bringing moisture from other places. The water then evaporated and solidified once it reached the colder poles. In addition to ice, they’ve detected the presence of organic materials. Though the possibility of life on Mercury is almost nil, it is likely that this organic material came along with the ice, hitchhiking on a comet. Scientists hope to use these new discoveries to obtain clues as to how life may have begun here on our own planet. By studying the organic material on Mercury and that which may or may not have been found on Mars, we can possibly make huge jumps in our knowledge of the formation of life-bearing planets and the evolution of organic material from its smallest forms. Hopefully that life on Mars rumor is true, though we’ll have to wait until next week to find out.